The National Education Foundation (NEF) has introduced two programs designed to enhance the digital literacy skills of American students and the job skills of the United States workforce. NEF, a nonprofit that focuses on enhancing academic and job skills for disadvantaged students and adults, has introduced the National Digital Literacy initiative and the Adopt-a-School national initiative, both in partnership with the State University of New York (SUNY). The $100-million digital literacy initiative will make available the Web-based Internet & Computing Core Curriculum (IC3) to all participating schools. 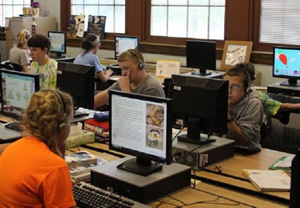 The course focuses on basic computer, computer application and Internet skills, all in line with standards that accompany the federal No Child Left Behind program. Any student who successfully completes the course will receive a certificate from SUNY. NEF plans to provide the online course, prepared by SUNY, immediately to school districts that apply to be part of the program and hopes to roll it out to every school in the United States by 2020. "We believe our students need digital literacy skills to compete in the global economy," said NEF Chairman Appu Kuttan. "Our national initiative is aimed at preparing our students better for college and the 21st-century workforce." The second initiative, the Adopt-a-School program, will set up STEM+ Cyber Learning Academies in financially disadvantaged schools in the United States. In this case, STEM+ refers to science, technology, engineering, math, English, social studies, digital literacy, IT, business and management. The academies will help the students at participating schools develop the skills they will need to compete in the 21st century. At the same time, local business will have access to more than 3,000 professional development courses and mentoring that they can use to train their staffs. Participating businesses will receive 50-percent grants to pay for the courses. Meanwhile, the fees that will be paid will help fund the academies for the students in the schools. "America is ranked 25th out of 35 countries in math and science," Kuttan said. "Our initiative is aimed at preparing our students and employees better for STEM-related jobs and college." School districts and employers interested in applying to participate in either initiative can go to cyberlearning.org for more information.